Packing in a class-topping 8.1-megapixel camera, the Sony Ericsson C905 is the new flagship model in its Cyber-shot cameraphone range. Lined up against recent 8-megapixel sharp-shooting cameraphones from Samsung (the Pixon and i8510) and LG (the Renoir and KC780), the Sony Ericsson C905 comes out fighting with HSDPA 3G and Wi-Fi connectivity, A-GPS positioning technology and Sat Nav software onboard. In addition, the user-friendly Cyber-shot camera set-up includes a high quality xenon flash to go with the gadgetry inside. What it doesn't have is the smartphone functionality of the i8510 or touchscreen control capability of the Renoir and Pixon. 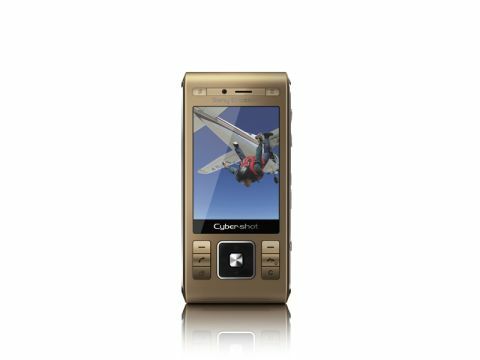 Nonetheless, the C905 does have a solid line-up of familiar Sony Ericsson feature-phone applications, including music and video players, Google Maps software, a full web browser and an FM radio. The Sony Ericsson C905 is the first Cyber-shot sliderphone, and it's a solid, substantial design. Weighing 136g, it's on the heavyweight side, and with a profile that goes from 18mm to 19.5mm where the camera bulges, it's certainly no slimline model like the 5-megapixel C902. With a rubber feel and metal casing, plus scratch resistant glass covering the screen, it feels reassuringly well built, and the numberpad slider mechanism is smoothly sprung and sturdy. Another well-crafted brushed metal slider on the back protects the camera from dust and scratches. It slips down to activate the camera too. Despite the chunkiness, it's an attractive design, with a definite camera look and feel to the device when held sideways in camera shooting mode. Its solidity also gives it a nicely balanced feel when shooting. The display is a decently-sized 2.4-inch QVGA, 262K-colour screen, which provides ample viewfinder space. It's not as large as the displays of its 8-megapixel rivals, but it is bright and clear. An in-built accelerometer automatically switches screen orientation in certain media functions to match how you're looking at the display. The control set-up is based around a square navigation D-pad, with columns of buttons on either side, for a conventional Sony Ericsson navigation experience. The buttons are close and smooth, so don't feel quite roomy enough for the heavier-fingered user. Controls are generally responsive though. The numberpad buttons on the slider are large enough, though they do feel a tad spongey for really speedy texting. They're also not the best defined numbers we've seen; although rows are adequately separated by chrome trim, only light bumps under the surface identify individual number buttons on the rows. There's no secondary front-facing video call camera on this phone for face-to-face calling (though you can make video calls using the main camera on the back if you want to). Around the top of the screen are two buttons that double up as gaming keys, but come into play as camera control buttons when the shooter's activated. Blue glowing camera control icons on these, and also on the D-pad, represent hotkey options for camera functions. The Cyber-shot camera user interface is easy to use, with the dedicated control keys offering fast access to certain functions, plus additional layers of settings to refine your shooting settings. The C905's autofocus system is a no-fuss, 2-step shutter button operated set-up that works efficiently. There are additional macro options for close-up shots, which can come out great, plus a face detection option that can lock onto up to three faces in a shot to help get sharp images of people. This works quite smartly too. It doesn't have all of the focusing gadgetry found on rival 8-megapixel cameraphones, such as blink detection or smile shot, or the touch focus used on the Renoir, but it does have Sony Ericsson's very clever BestPic option. This enables you to take a burst of seven shots when you click the camera button, including shots buffered just before you press it as well as after, from which you can select the best image. The 8.1-megapixel camera offers a step-up in shooting potential on this model. Images are sharp, clear and detailed, with good colour rendition and plenty of richness to shots. Exposure is handled well, and there's an additional Smart contrast option to enhance levels in demanding lighting conditions. It's a cracking performance from a cameraphone. The xenon flash ups the shooting performance in low-light and dark conditions, filling scenes with plenty of light without overpowering subjects, and offering good illumination over a larger range than most weedy cameraphone LED flashes. Red-eye reduction is available too. It's a very welcome component of the C905's shooting armoury. A goodly selection of shooting adjustments can me made to the responsive auto metering system. Scene settings give you options for different environments or snapping requirements, plus there are white balance and exposure tweaking options.Typical mobile colour effects and frames can be added too. Among the more detailed settings you can switch on an image stabiliser, and usefully, there's an Add Position option for geo-tagging pics with the aid of the A-GPS system – so you can view them superimposed over a map of where they were taken on the phone's Google Maps app, or on a suitable online service or desktop application. Both images and video can be tweaked after shooting, and there's a fast blogging option as soon as you've captured shots. Video shooting is similar quality to the C902's – QVGA at 30 frames per second, so is smooth but not such great resolution as LG and Samsung's rival 8-megapixel devices. It looks OK in fullscreen mode on the phone, though. A-GPS is another standout feature that does a decent job on the C905. It's allied with the Google Maps application that's recently become a Sony Ericsson mid-tier staple feature, adding precise position finding to that very useful mapping, route finding and search application. Google Maps is handy to get location-based info, but isn't a full Sat Nav set-up. Instead, Sony Ericsson includes Wayfinder Navigator 7 Sat Nav software pre-loaded – or at least a three-month trial version of the software. Using over the air updating, you can get 2D and 3D route planning and turn-buy-turn guidance, including voice directions. It's another useful software addition, and is sophisticated for a feature phone. It's not, however, as function-laden and smooth an experience as some of the better smartphone Sat Nav memory card-based packages, or an in-car kit, relying on over-the-air updates of maps and info rather than having it pre-loaded. The A-GPS system works effectively, though, and is fairly quick to get a positional fix when fired up. Another Sony Ericsson app, NearMe, is pre-loaded too for location-based local area information about entertainment, services and so on. Although Sony Ericsson tends to keep the best elements of its Walkman music mobiles and Cyber-shot cameraphones apart, the C905 is capable of putting in a very acceptable tune playing performance. Unfortunately, unlike on high-tier Walkman phones, the supplied earphones are pretty average. And as there's no standard 3.5mm headphone socket on the phone, or 3.5mm adapter with the in-box headset, you'll need to source an adapter yourself or use a spare Walkman set to get the best possible sound quality. Out of the box, audio quality does sound acceptable if not out of the ordinary, but with better earphones, the performance is distinctly improved. Sony Ericsson boxes a 2GB Memory Stick Micro memory card with the C905, giving you a bit of legroom for adding tracks as well as handling large image files generated by the high resolution camera. Onboard available memory is 160MB, so a card is needed. Higher capacity cards up to 8GB are supported on this phone. An easy to use FM radio is included too, and the latest version of Sony Ericsson's TrackID song identification software is embedded. With Wi-Fi connectivity onboard you can get high-speed data connectivity from home Wi-Fi set-ups, work networks or public access hotspots – ideal if you want to download content online without incurring mobile data costs, or upload content such as videos or high res images speedily (and cheaply). It's easy to set up and use in just a few button clicks. Mobile HSDPA connectivity gives fast mobile data access too – offering maximum downlink rates of up to 3.6Mbp. The full web browser is similar to other Sony Ericssons, so provides a familiar, straightforward to use home screen and a reasonable (if not iPhone-like) web-browsing experience for this class of handset. Streaming or downloading audio or video from mobile network operator services is supported too, and is suitably quick to do. You can also easily copy content from a PC to the phone using supplied Media Manager software and a USB cable, or by dragging and dropping in mass storage mode, or via Bluetooth. A USB memory card reader is in-box too for quick copying straight to a card. Alongside the higher-spec gadgetry, Sony Ericsson has packed in a good helping of typical mid-tier software. Its organiser and messaging functionality ticks the right boxes, including email support, calendar, alarms, tasks, notes, voice recorder, world clock, timer, stopwatch, calculator and a code memo function. An AccuWeather.com app provides web-based weather updates and forecasts too, and three games come pre-loaded. Sony Ericsson scores highly on the essentials of voice calling, with a high quality, clear performance on call in a variety of conditions. We were less enthralled by the battery performance, with some heavy juice-using features such as GPS, Wi-Fi and the xenon camera flash accelerating the run-down times in our tests. In optimum network conditions, Sony Ericsson reckons it can achieve 360-380 hours standby or talktime of 4 hours on 3G networks or 9 hours on GSM. We found ourselves having to charge most days, though, if we used the high-ticket features regularly. Raising the bar for its Cyber-shot range, Sony Ericsson's 8.1-megapixel Cyber-shot phone is a highly attractive option for those with a strong in interest in high quality cameraphone images. It produces very presentable printable shots, with the xenon flash adding extra power to low-light shooting. As an all-round handset, the Sony Ericsson C905 may not have the feature punch of a top-end smartphone and is certainly no slimline pocketful. But Wi-Fi and A-GPS technology do add some extra high-end appeal to superb cameraphone package.